Garden Journal Entry 5/31/08: Seasonal Strawberry Eating At Its Sweetest & Juiciest Best! Sometimes you just need to have a slab of cake for breakfast - with a big side of strawberries. This morning I trudged back to The Shack from the front field, sweat-soaked and starving after wrestling with portable electric sheep fencing for an hour under the hot sun, and promptly treated myself to this plate of ruby red heaven. Oh, and there was a large scoop of creamy French vanilla ice cream involved, too. Now it's back out to the field and the fencing - then hopefully the garden! © Copyright 2008 FarmgirlFare.com, the award-winning blog where we just may have to have a repeat of this breakfast for lunch. I forgot to have strawberries for breakfast. Can you believe it? These gorgeous beauties were out in the garden, hanging by their stems and just waiting to be devoured, yet somehow they completely slipped my mind. I had a whole wheat tortilla with peanut butter and - get this - storebought strawberry jam instead. It's embarrassing, really. At least the jam was organic - and I remembered about the strawberries in time for a sweet and juicy mid-morning snack. Last year I planted a brand new strawberry patch in one of my 4' x 8' raised beds. (I'm enamored with raised bed gardening, which I started doing 8 years ago, and one of these days I'll get around to telling you why, I promise.) My old bed had served me well for several years, but even if you do things like thin them out and mow down the plants (which I probably didn't do since they are in a raised bed after all), a strawberry bed will only last for so long. Most of my plants actually kind of evaporated, to be taken over by large clumps of very happy grass - which made a wonderful dog bed. I even have photos. But I digress. Anyway, in January of 2007 I ordered 30 Cavendish strawberry plants (which are actually more like little bundles of roots with a crown and maybe a leaf or two than actual plants) for $9.95 from my beloved Pinetree Garden Seeds, tucked them in the ground (not too deep, not too shallow) on May 7th (they don't ship you your plants until after the danger of frost), watered them regularly, and snipped off every single blossom that dared to make an appearance. That's right - no berries the first year means much bigger and healthier plants the next. It isn't easy, but it's worth it, trust me. For the first several months I also snipped off all the runners so that the plants wouldn't concentrate their energy on producing baby offspring plants, but when the deer started sneaking into the garden at night and munching down the entire bed (this was before I thought to cover it with floating row cover to deter them - which worked), I decided that a few extra runners to fill things out might in fact be a good idea. What I did was wait for them to put down a few roots and become established, then I cut the mother cord and left them on their own. They did great. High yields of large berries with excellent flavor make this a good choice for home gardens or roadside stands. High resistance in red stele and intermediate resistance to verticillium wilt. Ripen over a long season. Grows best in zones 3 - 8. It has been a long time since we introduced a strawberry that has made new friends as Cavendish has done. Cavendish is proven winter-hardy through Nova Scotia’s extra-frigid temperatures. It runners so well a child can easily establish a solid plant stand and it produces crops weeks longer than other Junebearers. It’s so bountiful it yields much larger crops per square foot than lesser berries. It is highly resistant to red stele. This is simply the richest, berriest-tasting strawberry you’ve ever let melt on your tongue. Or put in a shortcake. Or drizzled over ice cream. If you’re ready for new pleasure in strawberry flavor, you simply have to try Cavendish. No longer premium priced. 25 virus-free plants are $8.55, 50 are $14.45, and 100 are $26.85. They are absolutely, positively, delicious! One of my very first posts on Farmgirl Fare was all about homegrown strawberries, and in it I confessed to having become a purist, feeling that the best way to savor a batch of luscious strawberries requires doing nothing more than making sure you have clean fingers and a plain white dish. Um, yeah, sorry but I really gotta go. If you need me I'll be in the kitchen. Or the strawberry bed. So what's your favorite way to enjoy fresh strawberries? © Copyright 2008 FarmgirlFare.com, where the best part about this year's strawberry crop is that so far that hasn't been a single turtle - or turtle bite mark - in sight! I need to get my original garden blog attitude - and pronto. Back in the spring of 2006, I started this blog with a simple goal - to help me keep better records of what goes on each year in my Missouri kitchen garden. I made it a separate entity from Farmgirl Fare, my main food and farm blog, so I wouldn't bore non-gardeners with obsessive ramblings about sheep manure, seedling woes, the joys of growing 19 varieties of heirloom tomatoes, and the unbelievable destruction wreaked by blister beetles. At first things went really well. I put up a short but newsy post nearly every single day, beginning most of them with a personal Realization of the Day, then babbling on from there. I was helping my gardening efforts and having fun. But as more and more kitchen gardeners (and would-be kitchen gardeners) discovered my little blog, I decided I needed to offer more helpful hints and how-to advice. Posts became longer and exceedingly more complicated. I began to hear from happy people all over the world whom I had helped or inspired to expand or create their gardens. It was wonderful. Then somewhere along the lines all those quick little posts and daily realizations dried up. I continued taking all kinds of photos, but I stopped making notes. Part of it was a simple matter of not having enough time to do everything I wanted to do (should I sit down and write something about the garden or actually go out and work in it?). But the idea of putting up a blog post that discussed nothing more than which flowers were blooming that day, or what I'd finally got around to planting, or even what I'd picked and enjoyed for dinner that night suddenly didn't seem like enough. And the longer I waited between posts, the more it felt like I needed to write a long article about something really substantial. Because this kind of daily detail stuff wasn't really going to help anyone become a better gardener. Except me. Which brings me back to the whole reason I started this blog in the first place - my need for a garden journal. I love being able to look back and find out what was going on in previous years. Because sometimes it's all those tiny, seemingly inconsequential details that really mean the most. Even just a photo can, well, be worth a thousand words - or simply be nice to look at. So I'm officially starting over. From here on out, I'm going to try to post something every day - or at least every other day. I have the photos, I have the realizations, I have lots of stuff going on in the garden (even when it feels like I'm so behind there's nothing planted out there - which in itself needs to be noted), and I have a strong desire to get back into that garden blogging groove. Wish me luck. In the meantime, here's a photo of the tiny white flowers that pop up in our front lawn each spring when I remind the Head Mower (actually, the only mower) to please steer clear of the stuff that doesn't look like grass because one day it'll be covered with charming little blossoms. And even though I have no idea what these plants are (which means I can't even impart a name, let alone any helpful knowledge, to you about them), posting this photo, which was taken back on May 13th, lets me know that yet one more flowering plant is behind its blooming schedule this year due to our cold and crazy winter. In 2007 I didn't bother to write about these fairy-like flowers, but I know that in 2006 they had already popped up on April 23rd - and on that same day I ate the first two stalks of asparagus (while standing in the garden), saw the first hummingbird of the season, and had some very happy Aconcagua pepper plants finally in the ground. Phew. Done. Now that wasn't too bad. Do you have a garden blog or blog about gardening? How has it affected your garden/gardening? © Copyright 2008 FarmgirlFare.com, the award-winning blog where it just started to rain - but I'm still going to try and finally get some really pathetic looking (and purchased!) tomato plants in the ground. 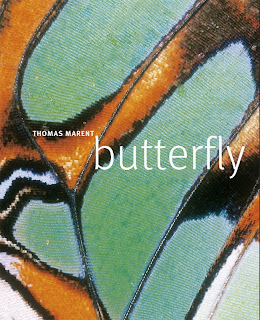 The Winner of Butterfly by Thomas Marent! I have always loved butterflies, since I was a kid. My fondest childhood memories of butterflies were the tiny orangish-brown cuties that would come to visit our butterfly bush every summer. I don't know their name, but they are so small and cute. I used to catch them sometimes (I know, that's bad!) to look at them up close. Here's a picture of a pretty butterfly on my finger in Costa Rica. It had just hatched from its cocoon at a butterfly farm. Congratulations Laura! Please e-mail me at farmgirlfare AT gmail DOT com and let me know where to send your new copy of this amazing book. Thank you all so much for sharing your butterfly stories and memories and links - what a wonderful collection to savor. I know this was a book giveaway contest, but I feel like I'm the one who really received the gift! © Copyright 2008 FarmgirlFare.com, the award-winning blog where Farmgirl Susan shares stories & photos of her crazy country life on 240 remote Missouri acres - and we're thrilled that it's the height of moth & butterfly season. Luna Moth Love & A Book Giveaway! "The monarch butterfly (Danaus plexippus) repopulates eastern North America every year after spreading north from Mexico. In fall, the entire population east of the Rocky Mountains returns south in a flight of over 1,800 miles, completed by a single generation. Guided by instinct, stopping only to sleep or refuel with nectar, their destination is a remote area of central Mexico, where hundreds of millions of monarchs gather in a few patches of highland fir forest. Here, the butterflies are safe from frost yet cool enough to spend most of the winter semi-dormant." We have all sorts of butterflies and moths here on the farm, and one of my favorites is the large luna moth. I was thrilled to come across this mating pair at the edge of the garden two years ago, and just yesterday I saw one perched on a beam in the sheep barn. According to Marnet, "female luna moths 'call' males in the night by extruding a scent gland at the tip of the abdomen. Males can detect the scent from a few miles away and react by flying doggedly upwind along the scent trail." Butterfly would make a wonderful gift for anyone enamored with these little winged creatures, and thanks to the nice people at DK Publishing (the same company that published Bread, one of my favorite bread books, as well as all sorts of other beautiful publications), I have a brand new copy to give away. Just leave a comment in this post between now and next Thursday telling me something - anything - about butterflies or moths: why you love them, what your favorite kind is, why you wrote about them on your own blog (leave a link to your post! ), your best butterfly story or fondest memory, or simply why you want to win this book. I'll randomly pick a winner and announce it in a new post on Friday, May 16th. Sorry, but due to the weight of this enormous book it can only be shipped to a U.S. address. © Copyright 2008 FarmgirlFare.com, the award-winning blog where life is always better with butterflies.